Some files contain so called meta data. This is for instance the case for doc and pdf documents. They may contain information about authors but also other information like the program name used to create them, title, tags and subjects as well as comments. Sometimes you may want to remove the metadata from the files, for instance before you send them to another user. While it is usually not a problem to keep the author reference, it is often a good idea to remove comments and other information that others should not be able to access. You can use third party software to remove metadata, like the previously reviewed Microsoft Word Metadata Scrubber or the JPEG and PNG Metadata Stripper. Microsoft has added options to remove metadata from a number of files natively into the Windows operating system. There are basically two options available. 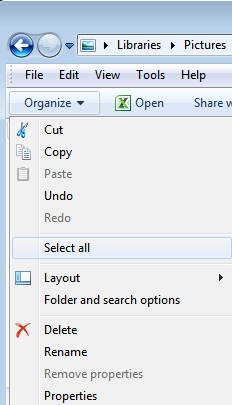 The first option is to right-click a file, for instance a Word document, and select properties from the context menu. 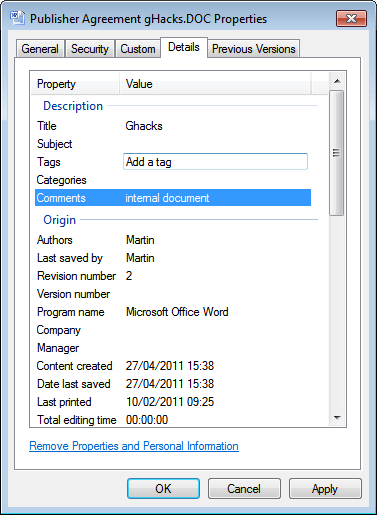 You then need to switch to the Details tab to see all the documents properties lined up. You can click on the remove Properties and Personal Information link at the bottom of the window, or click in a specific field to remove, edit or add values. You could remove information about the author, comments or the subject from a document before sending it to a third party, or to add those information before you do. This works well for single documents, not so much if you have to edit the file properties of several documents or files at once. Before we discuss that I'd like to point out that there is another option available. When you select a document in Windows Explorer you see some of its properties which you can edit right in the toolbar there without opening the properties. The following option is not working on all systems. I have yet to find an explanation for this. It does not work at all on my 64-bit Windows 7 Professional system for instance. Select multiple files in Windows Explorer, for instance some png, jpg, doc or pdf files. Switch to Organize in the toolbar below the menubar and select the Remove Properties option from there. Please note that Windows will create copies of the original files with removed properties. The idea here is to clean a number of files from sensitive information before sending them to a third party.